We specialize in Permanent Residency applications and other visa services. 16% DISCOUNT – Anniversary Special! Watch our clients’ testimonials or read our reviews. NTRUST is Singapore’s first specialist Australian migration agency. Established in 2003, we have helped thousands obtain an Australian Permanent Residency (PR) status. NTRUST’s approach towards Australia Immigration gives our clients an edge over others because our team of Registered Migration Specialists are allocated on the basis of our client’s occupational skill set and choice of settlement. We succeed, where others fail simply because of our intimate knowledge and unparalleled experience dealing with the specific Australian skills assessment and state government authorities. Consider your service provider’s track record and independent reviews and you’ll notice the difference when you pay to attend a professional consultation session. When engaging an immigration agency, it is important to research thoroughly, attend a seminar and schedule for a professional consultant. Your representatives should be knowledgeable, efficient and their fees reasonable. 3. Appointing NTRUST will assure you that your visa application will be in the best of hands. 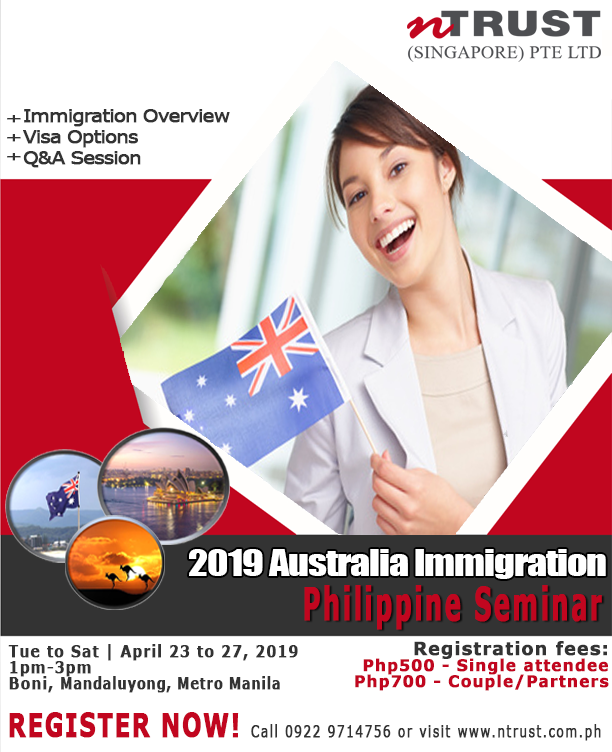 To determine your eligibility to migrate to Australia from Singapore or elsewhere, complete our free online assessment, register online for our seminar or ring +65 6299 0245 to schedule an appointment. To find out more about migration to Australia from Singapore, register for our up-coming Singapore seminar. I learned a lot about skilled migration during the talk, information that I did not find in my Internet research. I thought I do not qualify but I learned from the talk that there is a way for me to work in Australia and become PR. The speaker explained the details about IELTS requirements and how to migrate. Good job! The information presented was relevant and increased my knowledge about Australia Immigration Regulations. It is certain that the seminar topic was adequately & professionally addressed by the speaker. Our main goal is to make our clients satisfied. Read our clients' testimonials. I have once attended a migration talk and from there, I had a good impression of NTRUST. Made me look forward to a better standard of living in Australia. NTRUST have been helpful in many ways and you attended to my every need. Great job NTRUST! Thank you. At first, I was very hesitant to use a migration agent because I thought I can apply on my own. So that’s what I did, I applied online for Australian PR on my own and sadly, my application was rejected. I was very depressed with the outcome wondering what I did wrong. I searched online for an agency that can help me to reapply and found NTRUST. I discussed my case with their consultant and he provided me with details why my application failed. I was impressed with his explanation so I decided to hire NTRUST to handle my case. This time, my application was approved after 6 months! What a relief! I can now live in Australia with my siblings. Big thanks to NTRUST. Excellent job! Being registered with the Migration Agent Registration Authority is one of the reasons why I chose NTRUST. Your staff have been professional and attentive. Thank you NTRUST, a better work-life balance and quality life awaits me and my family in Australia. I remembered your seminar as very informative, just as good as the reviews we have read online. It helped us decide to gain knowledge and proceed with our visa application to Australia after meeting their registered agent. The way NTRUST handled our application was excellent. Very detailed, responsive and everything was very transparent. My family and I are now looking forward to a better lifestyle with work-life balance in Australia. NTRUST was actually the second migration agency who handled my application. I was not satisfied with the services that my first agent provided me because of the very slow progress of my application. My friend referred NTRUST to me and so I did transfer my application case to them. It was a very good decision as my application started moving the way I expected it to be and had my visa approved finally! If you are looking for a good Australia migration agent in Singapore, NTRUST is the way to go. Having an age of 45, I thought I was too late to apply for Australian immigration points system under skilled migration. Nevertheless, I decided to give it a try after the consultant explained my visa options and the possibilities of still being able to make it. A few months later, I received a phone call from NTRUST informing me that my visa has been approved. I am really happy I decided to give it a try otherwise I might never have the chance of living the life I always wanted with my family. I used NTRUST previously when applying for PR visa and found their services professional and very efficient. Hence, for my RRV application, they did not disappoint me again. They truly live up to their reputation of having a high success rate! Thank you NTRUST for the good news. This application could not have been so smoothly without your excellent support, advises and attentiveness to the details. I would like to express my appreciation to you and your team for all the efforts! Thank you very much! I have a friend who had obtained his visa through NTRUST’s assistance so I know that my application will be well taken care of. Surprisingly, my permanent resident visa to Australia was granted faster than I expected. Thank you NTRUST you have been very efficient, prompt and helpful. I am very happy with the experience I had and would recommend NTRUST to anyone I know who’s looking to migrate. I remember when I was searching for an Australian migration agent and I encountered so many consultants but I think I made the best decision of narrowing down to you. Your team did a wonderful work for me and I thank you for delivering such an efficient service. I must say your team are thorough professionals who know how to achieve success for their clients. I got the best advice at all times whenever I needed it most. Once again a BIG THANK YOU! Australia is a less stressful country and it offers better job opportunities. There are natural resources which I can enjoy more. Having a clean and healthy environment is also one of the factors that attracts me to migrate. NTRUST was recommended to me by my friend. Everything turned out well. I am very happy with the way the staff handled my application. They really handled my application well. Thank you. Our children’s future is our main consideration why we wanted to migrate to Australia aside from a more relaxed lifestyle. The various changes in regulations have caused delays in our application and there were times when we were frustrated. However, you helped us throughout the process and always encouraged us not to give up hope. We are indeed thankful to you for believing that our dreams can be made possible. Thank you NTRUST! Our visa application to Australia was handled by you in a very professional manner. You were prompt and kept us updated on all aspects of our application. In fact, without your professional service it wouldn’t be possible for us to obtain our PR visa within this short time span. Thank you NTRUST for the excellent service! NTRUST was appointed by us for our visa application due to your professionalism. As expected, you are prompt and professional. Clear directions and advice were given throughout the whole process till our visas are granted. We are pleased. I can now look forward to the better quality of life and fresh air in Australia. I intend to have more quality time and retire in Australia. I found NTRUST from some newspaper articles as well as the Internet. Having gone through different Australia Migration agencies, NTRUST is far better in terms of professionalism. They are reliable and efficient, and they helped us through until our visa was granted. Our main reason in migrating to Australia is to be with our family. I found NTRUST online and attended their immigration seminar. I was impressed with the presentation and decided to engage their service to assist us with our Australia visa application. NTRUST professionally handled our application. They are very efficient, coordinates well, and responds quickly. Thank you NTRUST! For me, Australia provides a better future and a good place for retirement as well. I chose NTRUST to assist me with my visa application because they were strongly recommended by my friends whom they have helped before. They are professional and I’m happy with the outcome of my application. We wanted to migrate to Australia for our children’s education and for us to have a more relax lifestyle as well. We chose NTRUST to assist us with our visa application because of its many satisfied customers’ feedback. They were very professional and helpful throughout the process. Thank you NTRUST! I love the Australia culture, having studied and lived there for 5 years. 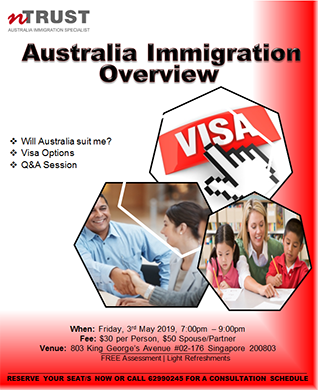 Before deciding to embark on my Australia visa application, I attended one of the NTRUST’s Australia immigration seminar and it was very well presented. That convinced me. Throughout the whole application process, all I can say is that you are very efficient and have handled my visa application excellently. NTrust has provided excellent service and we were delighted to have our visas granted within just 8 months from starting the application process. We were given sound advice, a clear timeline of how long each stage of the process is expected to take, and also had our expectations managed upfront with the odds and implications of each decision explained to us. At each stage of the process, we were also given clear instructions on what documents to prepare and how to go about getting the required certifications; everything went smoothly thanks to the NTrust team. We would especially like to express our gratitude to Ginny, who was approachable, handled our application so professionally, patiently addressed all our questions and provided timely updates with every step of the way. We would highly recommend NTrust for professional advice and service for those who would like a peace of mind, knowing that one’s application is well taken care of.